The first time I had this was on our Honeymoon when we were staying in the Tea Country of Sri Lanka. I thought it was delicious. When out I have sometimes been known to ask how things are made, as I did with this in Sri Lanka. I was totally surprised that it had dates in it. You don’t taste them at all and it completely blew me away. Upon moving to London, I have found that is a quintessential British Dessert. Having made this a few times and tweaking the recipe here and there I came up with one that I LOVE! 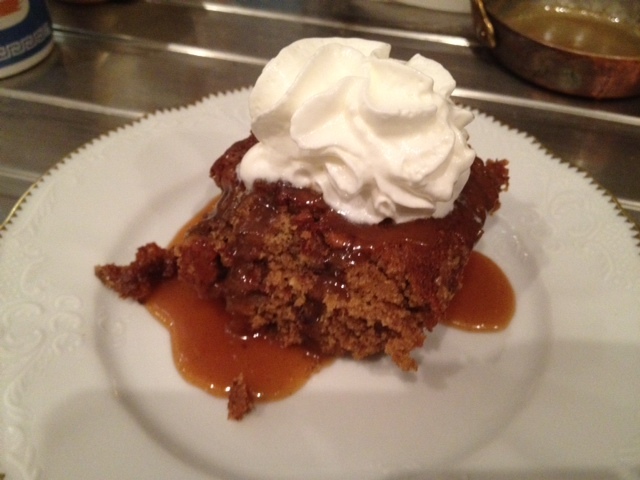 It is a perfect dessert as it starts to get colder and the flavors remind me of the holidays. Take about half of the Citrus Caramel Sauce and spread evenly in the baking dish and place in the freezer for at least 30 minutes. In a separate bowl place the dates, baking soda, and boiling water and let the dates moisten while making the rest of the pudding. In another bowl mix together both sugars and butter until combined about 1-2 minutes and add the eggs, one at a time, with the cloves and cinnamon. Slowly mix in the flour and baking soda. Once all well combined add the date mixture and lastly the toasted chopped Pecans. Remove the baking dish from the freezer and pour in the batter. Bake for about 30 minute. Heat the remaining Citrus Caramel sauce and our a little over each piece and serve with either whipped cream or Vanilla Ice Cream. Serve warm. It will literally melt in your mouth!